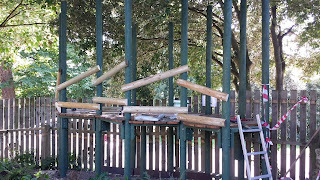 but a torment to themselves"
The past two weeks have seen a lot of progress with the Jurassic Garden viewing platform. 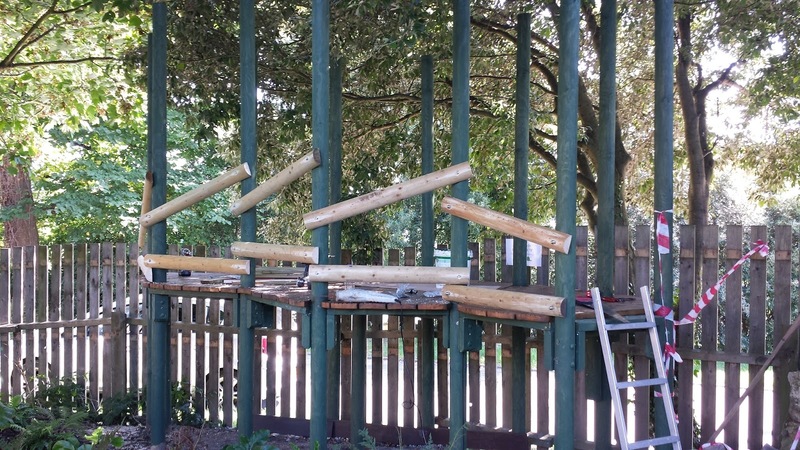 After the floor had been secured and fixed the front pickets were secured. The pickets were fixed just off the floor level to assist with ventilation and drying of the wood. The design and format of the back of the observation post took a while but the group settled again on pickets. 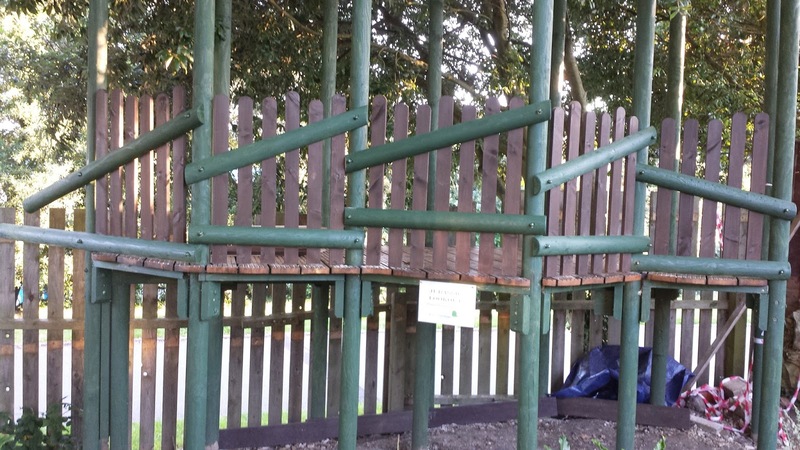 Thirty five 1.8m pickets were sourced from Dorchester Timber and after painting, they were also set in place. The final job will be the steps into the lookout. It is hoped to start this coming weekend. The timber and tools are all ready. We just need some good weather! Elsewhere in the garden the greenhouse has been cleared and the tomato plants taken out. It was a poor year for tomatoes and it seems that we were not alone! A bit of reshuffling within and tidying up has taken place. As the night temperatures drop the succulent plants have been returned to the shelter and relative warmth of the greenhouse. The Morning Glory continues to flower and there are just a few cucumbers left to ripen. 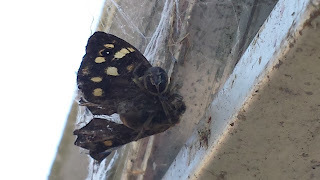 With the cooler weather spiders are retreating and the inside of the greenhouse is a good place to set up home. There are a lot of webs visible. This spider had recently caught a Speckled Wood butterfly. Outside Autumn is slowly approaching but the sunny days still bring out a lot of insects. The 'bee beds' have done well this year and the Aster plants were covered with bees and hoverflies last weekend. 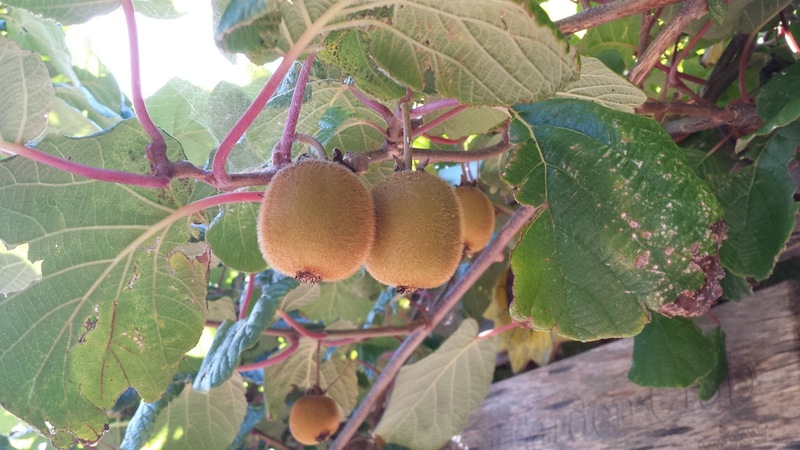 At the HQ shed the Kiwi plant has excelled. It has formed flowers for many years but this year has produced fruits and they seem to be doing well. Literature suggests leaving them on the plant for a while longer yet. 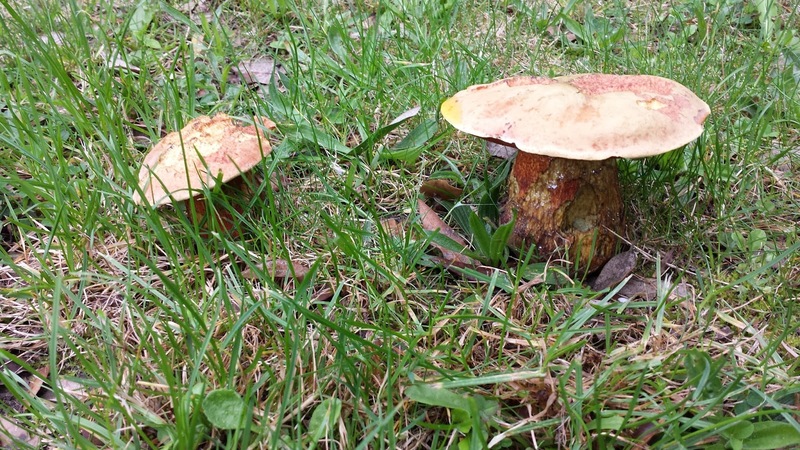 The appearance of fungi is also a sign on the approach of autumn and these magnificent 'boletus' mushrooms appeared just out the garden on the grass. They look like 'penny bun' mushrooms- so called for their similarity when freshly emerged to baked buns! The bee houses which we put up around the garden are slowly being used. Close inspection here shows that leaf cutter bees have moved in and laid eggs in the drilled out holes. Pollen is stored in with the egg and then the entrance sealed with chewed leaved and small fragments of leaf which can clearly be seen. 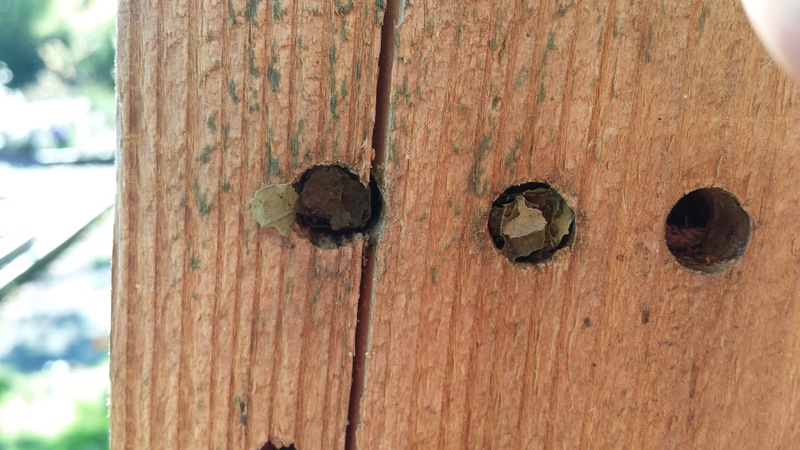 The bees have moved in! 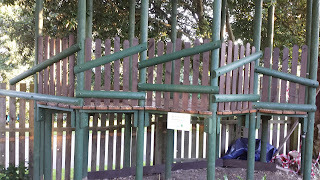 Hopefully the Jurassic lookout will be finished this coming weekend and then the group can start gardening proper again and begin to tidy up and get everything shipshape for the winter. There will be much to do. Help is always appreciated. Please leave your name in the school office if you would like to join us. Your contact details will be passed on. "Give a man a fish, and he'll eat for a day.